Official Yunnan provincial information credits a Chef Yang Li (楊瀝), from Jianshui County (建水縣), for inventing the steam clay pot more than two hundred years ago. 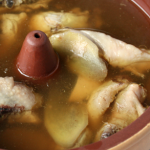 Originally used to make simple steamed chicken soup, over time medicinal herbs were added to make different kinds of healthful soups as remedy for various ailments. Other types of meat such as pork and beef were also used in more recent times. But chicken is still the meat of choice among Yunnan cooks. My steam clay pot was actually a gift from my sister more than twenty years ago when she visited us from Singapore. I had not seen this pot for sale in retail stores anywhere in the U.S. That is until recently when I discovered The Wok Shop in San Francisco sells it online . I was originally dumbfounded about what to do with this pot. My sister was only able to tell me the most basic cooking instructions of steaming the soup over boiling water. Then I discovered various recipes to use with this pot in cookbooks and online. Over the years I’ve experimented with many of these recipes but I always return to the original, simple way of making a chicken soup flavored with ginger and wine. It is truly amazing that three ingredients, with a dash of salt and pepper, can create one of the most delicious soups of all time. So if you’re as crazy about exotic cookware as I am then order this Yunnan steam clay pot post-haste, and make this chicken soup. You will be completely astonished by how a simple recipe can create such depth of flavors. I like to use dark meat for this recipe because it maintains a tender and smooth texture even after long period of cooking. You can remove the skin to reduce the fat in the soup. Cut the chicken legs into about one-inch pieces. Put the chicken in a medium stockpot and put enough water to cover all the meat. Parboil the chicken for about three to four minutes. Skim off the scum from the top of the water as it cooks. 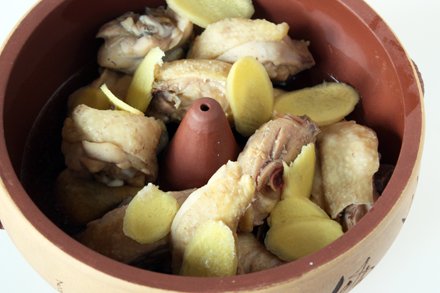 Scoop the chicken pieces out and place them in the steam clay pot. Discard the water from parboiling. Add the rest of the ingredients in the steam clay pot and cover. Place the steam clay pot over a medium stockpot that’s filled with hot water. Cut long strips of parchment paper of about two inches wide. Be sure to cut enough length to surround the pot. Make a thick paste of flour or cornstarch with water to a consistency of paper glue. Spread the starch paste on the parchment paper strips. Seal the seam of the pots with the parchment. Then bring the water to a slow boil and cook the soup for about three to four hours. If you notice that there is no more steam coming out of the spout the water may have boiled away. Remove the seal, add more water and seal the seam again. 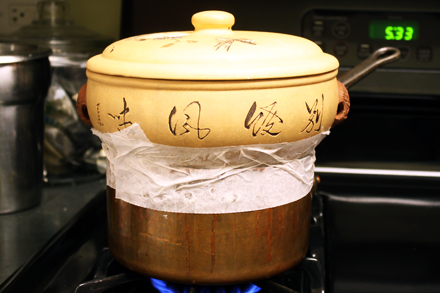 Continue to cook until the condensation has created enough soup to fill the steam clay pot. Serve the soup in the pot immediately after removing the paper seal. I love that pot. Thanks for explaining about the cooking spout and how to use it. Now, I’ll be on the look out when I head to the Asian grocery store again. I’ve not seen this lovely pot before and you’ve explained it well. Some of the best dishes I’ve tasted surprisingly have very few ingredients. Freshness is definitely essential. OMG. Is this the same clay pot you can use to make the famous clay pot rice? Sophia, This is not the same clay pot for making clay pot rice. Regular clay pot without a spout is used for making rice. Glad to find this recipe — my mom used to make this dish with a celadon version of the pot my dad brought back from Thailand in 1969. Wonderful recipe but the pot is no longer available from The Wok Shop and nowhere in Flushing… any ideas where I could get one? Kam Man, lower level. South side of Canal Street between Mulberry and Mott. 2 or 3 sizes available. Question about Yunnan pot recipe. Do they sell parchment paper in the Asian market? If not, where can I find it? Or can I use wax paper? Sally, You should be able to buy parchment paper in just about any super market. Otherwise gourmet shops like Williams-Sonoma also carries them. You may be able to find them in large Chinatown supermarkets as well. 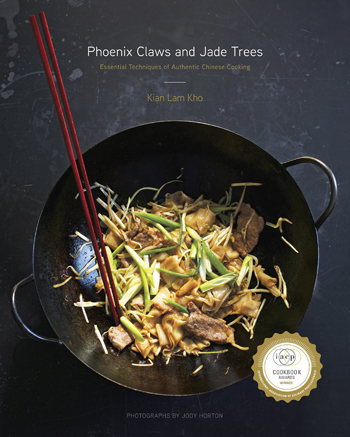 Addicted…that is what you will become if you invest in a Yunnan pot and make this recipe. It happened to my husband and me. It will happen to you, too. Don’t believe me? We bought a Yunnan pot in October and we have made this recipe once a week since. (I am on here now checking a quantity before we make it) Great post! Margaret, I’m so pleased you like this soup. Warren and I love this soup as well. I make it just about every other week. I picked up a Yunnan red clay pot at a yard sale not knowing what it was or how to use it. I love cooking and baking and I’m always trying something different so whatever this pot was, I had to have it. Thank you for the info and recipe for this pot. Looking forward to the chicken soup. The Yunnan steam pot is a marvelous invention. Enjoy the soup and if you’re in the New York area you can sample this dish at a new restaurant I’m working at… Lotus Blue. Well I made the chicken soup and it was great! The is the best chicken soup I have ever had. I substituted some of the ingrediants but stayed with the cooking technique because I cook with what I have on hand. It’s more work then opening a can of Cambell’s but well worth the end results. This soup makes me want to take a trip down to Lotus Blue. My dad gave me 2 pots that they bought while living in Taiwan. Unfortunately one of the funnel tops on one broke, the top can be fixed but not sure what I can use, glue wise, to repair it. I would love to find recipes or a recipe book. I love the idea of eating a fabulous chicken soup made in a Yunnan steampot–but limited space suggests I would have more use for a multi-tasker. Do you have recipes for other dishes using this pot? You can cook many different kinds of meat in this pot. Lamb, beef, frog, turtle and ham are all examples of what can be used. But the technique is generally the same. Prep the meat then add accompanying ingredients and spices before steaming for a few hours. I discovered that Joyce Chen markets the Yunnan Pot, I found one in a friend’s kitchen in the box — never used. Gave her this web site and now it’s in use!! I’m glad I was able to be the catalyst for your friend to start using this pot. It is an amazing pot! I bought a Yunnan Pot in Chicago’s Chinatown, after reading about it in a 1985 cookbook that I acquired, probably, at a garage sale. It is wonderful! But I don’t simmer chicken first and I don’t seal the pot/yunnan pot with parchment paper. No steam is escaping between the pot with the water and the Yunnan Pot. Why make it more complicated than it needs to be? Also…I only steam the chicken for 45 minutes. It is thoroughly cooked at that point. Further steaming would only be to increase the volume of chicken stock. I’m so pleased to hear that you enjoyed your Yunnan steam pot as much as I do. It is a wonderful cooking implement and I’ve never fail to create amazing soups from it. Par-boiling meat before making soup and braised dishes is a uniquely Chinese cooking technique. The step ensure that the impurity and scum from cooking meat are removed before the actual cooking. The result from this process is that you’ll get an incredibly clear soup or sauce when you’re done. Try this the next time you make your steam pot soup and see the difference. You’re right that steaming for an hour will cooking the chicken thoroughly. But try cooking for a few extra hours then taste the soup and the meat. You’ll find that the meat is so tender that it falls off the bone. In fact the bones are cooked so thoroughly that they are almost chewable. Besides the extra soup is so satisfying. Sealing the pot with the water bath is optional and it does help prevent steam from escaping. You can also use a rolled up wet kitchen towel to line the seam of the pot for this purpose. I found one of these clay pots at a second-hand store and bought it because of its beauty, not knowing what I could cook in it. I’m delighted to find this recipe & can’t wait to try it! Thanks for posting. HURRAY! I’ve had a clay pot like this for over 10 years and have only used it to make warm apple dishes. I have looked long and hard to find out what this pot is for. Like others who mentioned it, I’m a fan of the kitchen oddity and couldn’t resist at a yard sale. Chicken soup is on the menu now! Hey Sparkes. I am very pleased you’ve found the perfect recipe for cooking in this steam pot. Enjoy! These pots have holes in the side for some sort of handles – but what sort of handle? Traditionally they would be tied with hemp rope for easy lifting. But with the pot sitting on another pot it is just as easy to use oven mitts. Thanks for the prompt response. I thought perhaps rope but the holes are narrow and sharp edged which seems risky of cutting rope. I had thought chopsticks – but too thin – or maybe wire. But as you say oven mitts are good. I gave had mine over 30 years; since I lived in Singapore. Just found it in a pile of stuff. Don’t think I bought it to cook in – just liked the style. But it did chicken yesterday and belly pork today. Both well. Using it on the base of a conventional steel steamer which it fits closely enough to need no sealing. What is the Shaoxing cooking wine like? I’m not near an Asian market and I am wondering if there is a substitution that I could use for this. Shaoxing cooking wine can be substituted by dry sherry. But you can always mail order them from many on-line Asian markets. If you can get it a dry Madeira – Sercial or Verdehlo – is even closer to Shao Hsing in flavour. I recall in Taiwan being given salted plums in wine to drink. An acquired taste! Cooked it tonight – very good. Why do you do the parboiling? Is it for reasons of hygiene? I’m glad you enjoy the recipe. Parboiling meat in Chinese cooking is similar to searing meat in Western cooking. It seals the meat before the actual cooking process. An added benefit is that when you parboil the meat the juice or blood from the meet form scums on top and can be scoop off. This means that the soup or braise at the end produced clean broth or sauce. 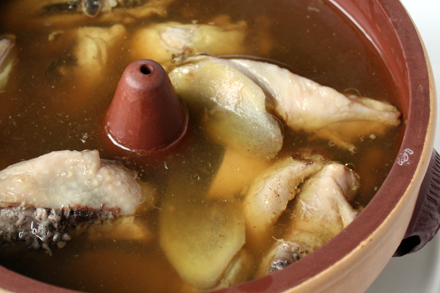 Try making the chicken without parboiling and you’ll see the broth full of impurities floating around. I am receiving a pot like this as a gift, but for ethical reasons I don’t eat animal products. Are there any vegetarian recipes you know of that work well in this pot? This pot was originally designed for steaming food over a very long period of time to either tenderize the ingredient or to extract the nutrients. For vegetarian dishes I would recommend using dried mushrooms, root vegetables and beans for use in this steam pot. These ingredients have incredible amount of umami and can withstand long slow cooking. Try making a soup with ginger, dried shiitake mushrooms, soybean sprouts, kelp, daikon radish and fresh corn. Add some Shaoxing wine and seasonings such as salt and ground white pepper before steaming. I bet you’ll get an incredibly delicious broth out or them. can you use this on a charcoal burner? This steam pot was specifically designed to cook food with steam. The condensation is from the steam is the core feature of the pot. So to use this pot on direct heat, or charcoal burner as you suggested, would defeat the whole concept of the pot. Definitely not recommended. We found one of these pots at Dong A Imports in Orlando, Florida, in the edge of the “Little Vietnam” neighborhood, just off Colonial Drive. We’re looking forward to trying it. Thanks for the recipe. What other meat can be used instead of chicken legs. Can I use chicken breast if I prefer white eat or even boneless skinless thighs? Thank you! Hi Cathy, I would recommend that you use skinless thighs with bone. The bone truly contribute extra flavors just like making stock to enrich sauces. Breast meat is not suitable because it will taste dry and not as flavorful. Can you recommend some traditional Chinese recipes for us vegans? Also, I own a collection of Ji4 Hing1 (宜興) teapots. Only one kind of tea can be brewed in each teapot, as the clay absorbs fragrance and would affect the taste of other teas. Does this principle apply with respect to the Yunnan steamer? Is there a method to cook plain rice in this pot? Yes Kamil. 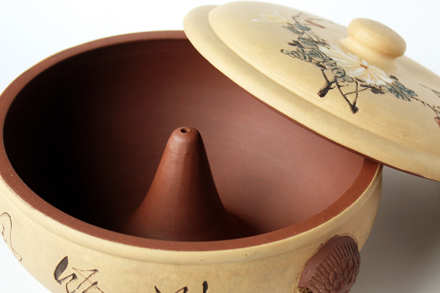 Just like the Yixing teapot this clay steam pot will also absorb the herbs and flavors of the broth being cooked in it. But if you’re just making savory dish in the same pot I would worry so much as the seasoned pot could in fact impart even richer flavors as the pot aged. As for steaming rice in this pot, I have not tried this. But it could be an interesting experiment to try this by adding rice and enough liquid to just moisten it. Then steam the rice until fully cooked through. Just found this page. I’ve spent an hour or so trying to figure out what a piece from an estate may be. I guess the decedent artist, had bought work of another artist: however, this pot is glazed inside and out, and also has a hole in the lid. I haven’t seen any pots, glazed inside or not, that have holes in the lid. Is this going to create a difficulty? Hi ltg, Just use water to wash the pot and air-dry properly before storing. Use a soft scrub (without soap) to scrap off any food residue. Good luck! Hi. My point of departure for using a Yunnan steamer has been Ken Hom’s book, Chinese Technique, Simon and Schuster, 1981. It’s a very funky book, and I suspect some of the recipes have been simplified a bit or modified for the American kitchen but it illustrates many techniques I’ve not seen in other books. His approach seems very direct, if not the most elegant. 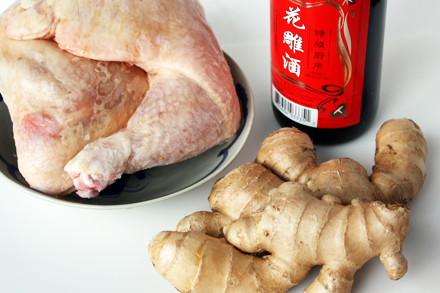 Anyway, his recipe for steamed chicken in a Yunnan steamer calls for the addition of chicken stock; why not, right? My question however is that curiously, he instructs one to place the Yunnan steamer directly in a wok, with water up to half the height of the pot, replenishing as needed. This struck me as odd, and I don’t see anyone else doing it. Besides the effect this might have on the seasoning of my wok and the need to top off the water, in your opinion would there be any benefit to this technique or is it just an eccentricity? Thank you! My friend gave me a pot like this for my birthday. I’m making chicken soup tonight following your recipe (plus a leek). It smells amazing. I can’t wait for it to finish cooking. Thanks for posting this. I’m glad you found the recipe to make use of your unique pot. Yes, this is an amazing pot that can produce wonderful soup with simple ingredients. I just picked one up at the thrift store. It’s the Joyce Chen – Good Earth Steam Pot. I’ve already used it, and makes the best rice. Just perfect!. I can tell I’m going to love it. But, would you happen to know what that ugly face looking thingy on the sides of the pot are? Also, what do the Chinese letters on the pot mean? Kian, according to John add additional broth to increase soup ???? Yes. You can start the soup by adding a little bit of water at the beginning. Put about 1 cup of water in the pot to start. I have a yunnan pot that my mother left for me and I have no idea how to use it. Your information is so helpful that I have to try it. I would love to use it for more then soup. Please post more recipes using yunnan pot. I will like to have one . Where can i buy one in New York ?